Janelle and Zach met in high school and went to prom together as friends, although they wouldn’t begin dating until a couple years later. After things got serious they began building a house together where they would live. On one Saturday Zach wanted to take Janelle to dinner but said he needed to stop by the house first to grab something. At the time the house was still a skeleton frame, and as Janelle entered the house there was a romantic setup, with roses and candles. There was also a picture book of their memories together and he proposed to her when she was done flipping through it. Wedding venues are expensive in Austin, Texas where the couple lives. While researching destinations they knew there were a couple of things they wanted; all-inclusive food and drinks, and a casino. This lead them to choose the Majestic Elegance resort in Punta Cana with their agent Candyce of Destify. The couple was pleasantly surprised once they found out the cost of wedding packages, and hosting a destination wedding proved to cut down on the size of the guest list too, without hurting anyone’s feelings. Janelle said, “We had 80 guests attend our wedding, if it would have been in Texas it would have probably been 300”. The couple agreed that you received a ton of inclusions and benefits at an affordable price at the Majestic Elegance. The resort felt like the right choice because it had wedding packages designed for larger parties. While working with the resort they found the wedding department to be responsive, and once on-site they met with their coordinator to finalize last minute details. On the day of their wedding, Zach left early to golf. Janelle met up with her bridesmaids to get ready in her Aunt’s room, which happened to be the elegant Presidential Suite. Their photographer met with both the groomsmen and bridesmaids while they got ready for photos before their ceremony. 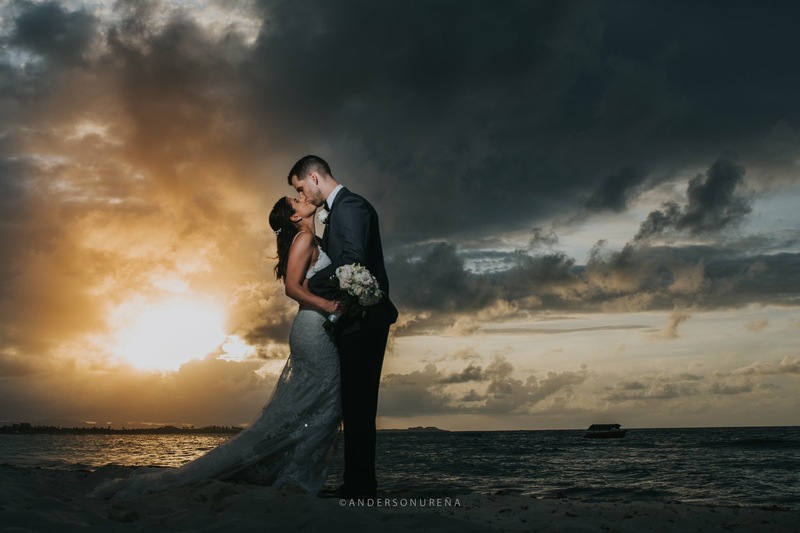 They recited their vows at the resort’s beautiful wedding gazebo and afterward, the couple took photos together on the beach with the sun setting happening in the background. At first, their families were skeptical of attending a destination wedding. Janelle said, “My father was like why would you go and do that?” But by the end it was clear everyone had a great time, her father even thanked the couple for hosting it in the Dominican Republic in his reception speech. The couple both agreed it brought all of their friends and families near and far together for a splendid vacation. Janelle’s advice for future couples is to make sure you don’t procrastinate and that you always keep a line of communication open with your wedding department. Don’t be afraid to use spreadsheets and keep questions organized on your computer. Being organized helped her better enjoy her time once she was in Punta Cana. Enjoy your moment while you’re there, it’s amazing!